Since 2003, coaches and consultants at The Mulberry Partners have been leading dynamic, forward-focused processes that inspire leaders, teams, organizations and systems to achieve goals, fulfill core values, realize visions and positively change cultures. Our track record for success in Executive and Leadership Coaching and Consulting is long and our experience is vast. If you, your team, organization or system are ready for a better way, contact us. We look forward to partnering with you! We are the Partnership People and the way we see it working together isn’t just nice, it’s critical to success. Meet Julie Harris, our graphic facilitator, and learn how she can help you. 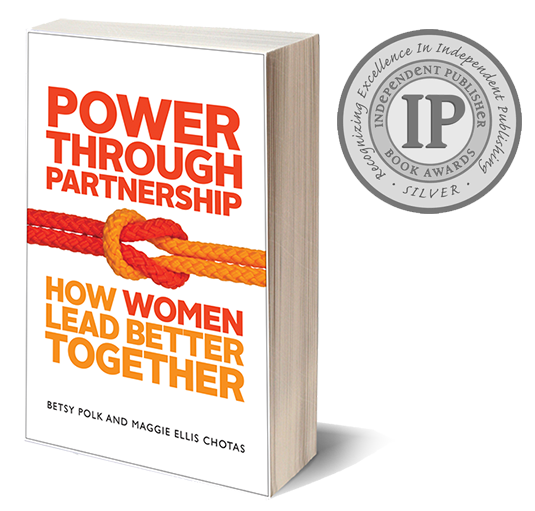 Drawing on the authors’ partnership that started in a tenth grade English class and featuring interviews with hundreds of women business partners, Betsy and Maggie’s award winning book shows that when women team up – combining complementary skills, channeling their egos into the partnership, and encouraging each other – they can work as equitable equals to achieve something that’s exponentially greater than what anyone can reach alone. In the process, they discover an unprecedented level of support, flexibility, confidence, accountability, and freedom to be themselves that they rarely find in other work relationships. To learn more, visit www.powerthrupartnership.com.